This Action Karate Trophy (Female) has a very upbeat design. The karate award comes with a brushed gold laser engraved plate. 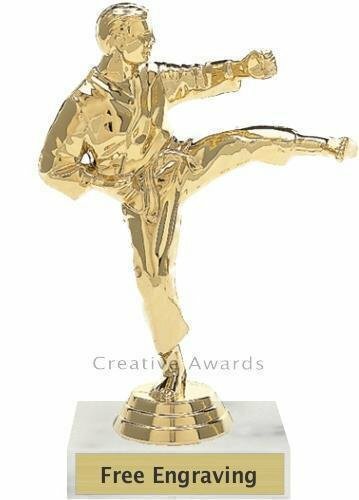 This Action Karate Trophy (Male) has a very upbeat design. The karate award comes with a brushed gold laser engraved plate. This Stars Karate Trophy has a very upbeat design. The karate award comes with a brushed gold laser engraved plate. 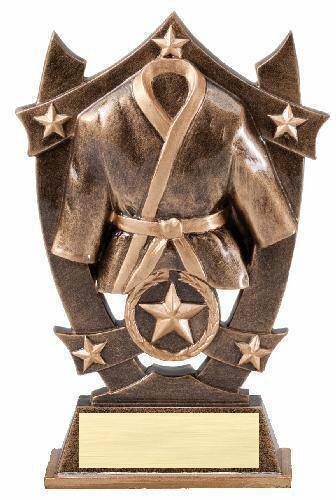 Looking for a very inexpensive karate trophy or participation award? This Karate figure on a white marble base is a great choice. 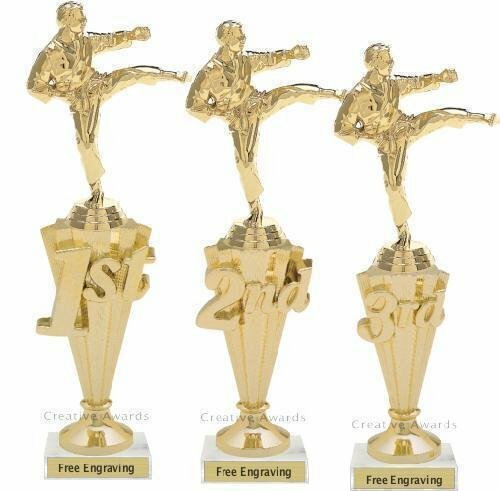 The commemorative Karate trophies come with a laser engraved brushed gold plate. We offer a large selection of karate awards. The All-Star Classic Karate Award is available with several different inserts. This Karate Trophy is a great value for the size. It comes with a laser engraved brushed gold plate. The All-Star Karate Award is available with several different inserts. This karate trophy is a great value for the size. All custom built karate trophies come with a laser engraved brushed gold plate. You will find a wide selection of karate awards. The Champion Classic Karate Trophy is available with several different inserts. This karate award has been a favorite for many years. All custom built karate trophies come with a laser engraved brushed gold plate. You will find a wide selection of karate awards. The Champion Karate Trophy is available with several different inserts. This karate award has been a favorite for many years. All custom built karate trophies come with a laser engraved brushed gold plate. You will find a wide selection of karate awards. The Champion Tower Karate Trophy is available with several different inserts. This karate award has been a favorite for many years. All custom built karate trophies come with a laser engraved brushed gold plate. You will find a wide selection of karate awards. 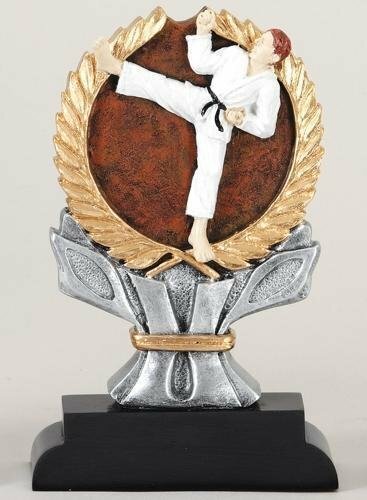 The Classic Karate Trophy is an inexpensive karate award that children have enjoyed for many years. 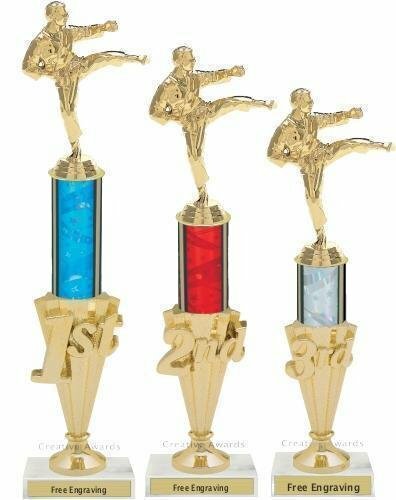 These karate trophies are a great choice for any budget. 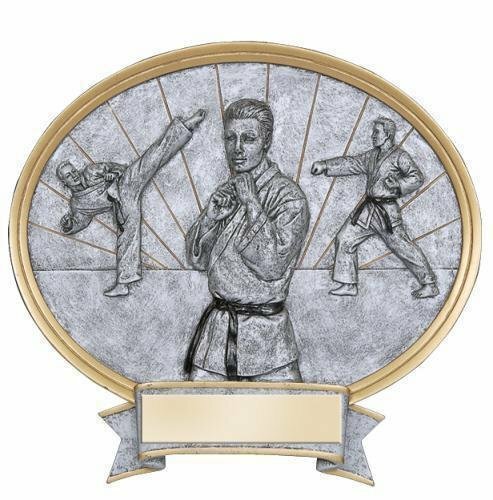 Karate awards come with a laser engraved brushed gold plate. The Crystal Cup Karate Award is a great choice for your champions. The clear plastic cup makes a beautiful Karate Trophy. All custom built karate trophies come with a laser engraved brushed gold plate. We offer a large selection of karate awards. The Crystal Cup Karate Trophy is a great choice for your champions. The clear plastic cup makes a beautiful karate award. All custom built karate trophies come with a laser engraved brushed gold plate. We offer a large selection of karate awards. The Cup Karate Award is a great choice for tournaments and league champions. The figure is on a 7" gold plastic cup. 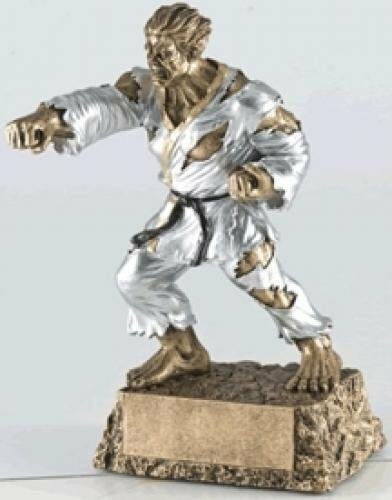 This karate trophy is economically priced. All custom built karate trophies come with a laser engraved brushed gold plate. We offer a large selection of karate awards. The Cup Karate Trophy is a great choice for tournaments and league champions. The figure is on top of a 5.5" gold plastic cup. This karate award is a great value. All custom built karate trophies come with a laser engraved brushed gold plate. We offer a large selection of karate awards. The Eagle Basic Karate Trophy is available with several different inserts. This Karate Award has a Column for added height. All custom built karate trophies come with a laser engraved brushed gold plate. You will find a wide selection of karate awards. The Eagle Classic Karate Trophy is available with several different inserts. 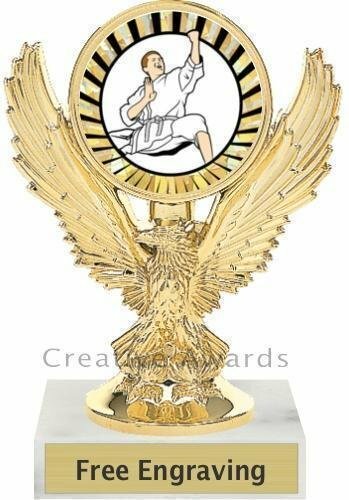 The karate award has a Column for added height providing a beautiful award with great character. All custom built karate trophies come with a laser engraved brushed gold plate. You will find a wide selection of karate awards. The Eagle Karate Trophy is available with several different inserts. It is a small inexpensive karate award with great character. All custom built karate trophies come with a laser engraved brushed gold plate. You will find a wide selection of karate awards. The Eagle Tower Karate Trophy is available with several different inserts. This impressive karate award is perfect for true achievement. All custom built karate trophies come with a laser engraved brushed gold plate. You will find a wide selection of karate awards. The 1st, 2nd and 3rd Place Karate Trophies are a great choice for tournaments and league champions. 1st Place, 2nd Place and 3rd Place Trophies are available in several configurations. All of the Karate Awards are economically priced to meet your budget. The trophies come with a laser engraved brushed gold plate. The First, Second and Third Place Karate Trophies are a great choice for tournaments and league champions. First Place, Second Place and Third Place Trophies are available in several configurations. All of the Karate Awards are economically priced to meet your budget. The trophies come with a laser engraved brushed gold plate. Picture shows the 1st - 3rd place trophies with 4, 3 and 2 inch Columns respectively.